Let’s be honest here if you go for the cheap option when it comes to your SEO and your Google rankings you can be certain of one thing, really poor rankings and bad results. So many people unfortunately go down this path and they do this for two reasons; firstly price which is obvious and secondly because they are completely naïve and feel that all SEO is the same and if they can get it cheaper from some company then they should go for it. In regards to the latter option nothing could be further from the truth and in this article I will clearly outline the reasons why cheap SEO is a really bad way to do business and probably one of the worst marketing decisions you will ever make. Google has seriously tightened up it’s ranking criteria and this means that any type of bad linking will be noticed immediately and this will have an impact on your websites rankings. Let me elaborate. Far too many business owners are seduced by really cheap SEO packages and feel they are getting a really good deal when in fact they are not. What they are getting is a company that will provide useless back links in order to substantiate the work they are doing. They will be happy to tell you that they have built 100’s of back links and they are doing all this work when in fact they are harming your Google back link profile. Basically, any punter can go out and purchase thousands of links for next to nothing and point them towards your site. This is what these cheap SEO providors are doing and Google is on the look out for this. If you think that this cannot happen to you (because the sweet sounding sales person you spoke to over the phone has told you that they only you the best and most relevant back links around) thinks again. Your heading down the path of a Google penalty and folks if you are reading this and you feel that this sounds familiar, you better get ready cause you are going to be in deep trouble very shortly. Google will and there is no escaping this, they will index these crappy links and your website will eventually disappear from the face of the earth. This is also known as a Google penalty and you better know this well as you are going to cop this shortly. When it comes to setting up a long term and sustainable Google ranking you need credible and high value back links. So how do I know this? Because I have to speak to people everyday who have suffered or are in the process of suffering at the hands of a dodgy, cheap, fraudulent SEO agencies. They were initially seduced by the cheap price and they are paying a heavy price for this now through zero rankings, sliding rankings and even worse a site that has completely been de-indexed from Google. In short cheap SEO is a fools dream and mirage of great things to happen in the future that NEVER eventuate. If your one of these poor businesses that were suckered into thinking that you could skirt around you SEO and believed the bull that was dished out to you over the phone then you better do something about this and do it fast. Remember the more irrelevant, poor quality links that are built pointing towards your site, the worse you are making it for yourself. You are digging a deeper hole and getting out of this void in the digital space is bloody hard. If you speak to an SEO company while you are doing the ring around and getting quotes, if someone quotes you very cheaply and tells you it’s all implemented locally, they are lying to you. If you think this doesn’t happen then let me tell you why it is impossible for an effective SEO campaign to be conducted on the cheap. Let’s say you’re a lawyer, plumber, cosmetic surgeon and you want to rank your website for these competitive categories. If you are quoted a cheap SEO price with a guarantee of rankings then these guys are simply trying to extort say $500 or so per month out of you without actually doing anything. Sure, they’ll seem as though they are doing their work by providing you with complicated graphs and grandiose reports full of meaningless fluff and waffle with no substance. Their theory is the more complicated they make it look, the more impressed you will be. These guys are really good at the whole smoke and mirrors thing to disguise the fact that they are simply sitting there doing this to other businesses over and over again. Their business model is in fact not SEO but a sales machine dedicated to ripping Aussie businesses off. The have mastered the art of the lie and of deception so well that they themselves think they are doing work. These guys actually believe their spin so much so that they end up convincing you. I mean, if they sound decent and convincing enough and if they are really cheap – then it must be good – how wrong this is folks. 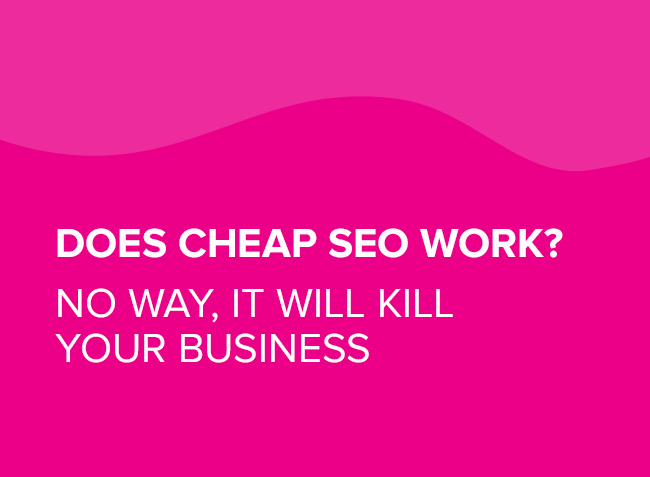 The take away of this blog post is that if you intend to pay as little as you can for SEO and if you want to go with the cheapest option then expect to fail. Google doesn’t care about your budget constraints or ROI. They care about relevant back links and these cost. Plus with the new Penguin 4.0 being rolled out if you have any bad links Google will notice these in real time. So if you go the cheap option, be prepared to pay the price. Search engine journal has some interesting reading on Penguin 4.0 : How Will Google Penguin 4.0 Update Affect My Site? 1) start up and on a very limited SEO budget – you can do SEO but aim for a local campaign and also throw some Adwords into the mix. 2) been burn’t in the past and are not prepared to invest in SEO again, you have to change your mind set as there are some credible agencies out there. Yo just need to know what questions to ask when talking to them initially. 3) been quoted by some other SEO agency a cheaper deal and want to see if we can match it – don’t waste yours or my time. We wont match it and all I can say is that we will still be here in 6 months when you finally realise that you’ve been sold a lemon. Call us on 02 9360 8514 if you are only serious about working with an agency that can ‘walk the talk’. We are not the cheapest but we are good at what we do – just look at our own page 1 organic ranking for the keyword SEO Sydney! Previous Previous: Why should you trust us with your SEO campaign? Next Next: Don’t worry about SEO just create good content – That’s wrong!